Low prices. OrangeSmile.com offers car hire service in Martinique on the lowest-rate-guarantee basis, since we work with car suppliers directly. For your search criteria in Martinique, we always select and show the best rental offers. The car reservation process consists of 3 simple steps: (1) search for available cars for your dates in Martinique; (2) select your car type; and (3) fill in the booking forms. Once the reservation is completed, you will receive a confirmation voucher to your email address. During the booking process, please check your rental conditions. To pick up your car at the rental point in Martinique, you need to provide our confirmation voucher, your driving license and a valid credit card. The final payment is normally carried out at the pick-up point. Our car hire points in Martinique accept VISA, MasterCard, etc - please check your rental conditions. At the pick-up point, please read the handling manual and check the car for present defects. 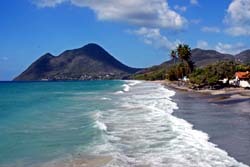 OrangeSmile.com wishes you a pleasant journey to Martinique! The car hire reservation system OrangeSmile.com allows renting a vehicle in Martinique within 10 minutes. Our largest database of car suppliers enables us to provide you a rental car in Martinique at the cheapest rate ever possible. At rental locations in Martinique we offer the following car sizes: mini, compact, economy, standard, premium and luxury. The following car types are available in Martinique: Sedan, Hatchback, Jeep, Cabriolet, Coupe, Minivan and Minibus. The first name of the island is Madinina, which can be translated as “the island of flowers”. This picturesque island is famous for its magnificent nature, beautiful beaches and, of course, interesting sights. Start your exploration of the island and its places of interest with a visit to its capital, the city of Fort-de-France. Here travellers should not forget to visit La Savane Park, which is located in the centre of the city. The park is decorated with beautiful palm trees and fountains, and its southern side is the location of ancient Saint Louis Fort. The fort was built in 1640; at that time it was the main protective facility of Martinique, which was saving the island from the pirates. Park Florale is a no less beautiful place. In this park eucalyptus groves are mixed with rows of tall palm trees. There are several markets in the territory of the park, where visitors can buy fresh seafood, souvenirs and crafts made by locals. Besides nature attractions, travellers are recommended to visit the main cultural facilities of the capital – the Museum of Archaeology, Schoelcher Library and the Regional Museum of History and Ethnography. Many interesting excursion programmes can be found in the city of Saint Pierre that was the capital of the country until 1902. Currently, the city hosts more than ten different cultural centres, each of which is unique and unforgettable. The most famous sights of the island include the Museum of Volcanology and House Museum of Paul Gauguin. The most famous destinations of Saint Pierre suburbs are l'Anse Couleuvre Cascade and ancient villages of Le Precheur and Bellville. A big fish market remains the main sight of Grand Riviere. In addition to delicious seafood, one can buy here fishing tools, rent a boat and move to the nearest fishing spot to test the newly purchased rod and try one’s luck in fishing. Saint Marie is another popular destination in Martinique. The town is mostly famous for top quality rum that is produced there. First rum was made in the town yet in 1660. Nowadays, the oldest rum manufacture of the island, Saint James Plantation, has been turned into a museum, where visitors can see how the rum is made and try different sorts of it in a special degustation room. Le Salines is another important excursion point on the island. The southern part of the town is the location of a very beautiful place – Etang de Salines Lake – and beaches that are often called the best in the country. Best hotels, restaurants and entertainment centres are located in that region. If your routes are to be mostly in the city, consider hiring a compact vehicle. It will be quite difficult to maneuver in a heavy traffic and find parking slot in Martinique in a large car. The damage to the car body, wheels and windows, caused in non-accident situation, is not covered by the CDW insurance package. These damages can be insured at the rental office in Martinique, by ordering a complete coverage package.